Omit sprinkles. Divide 3/4 cup BAKER'S ANGEL FLAKE Coconut into thirds. Place 2 portions in separate resealable plastic bags. Add 2 drops blue food coloring to coconut in one bag and 2 drops red food coloring to coconut in second bag. Seal bags; shake until coconut is evenly tinted. 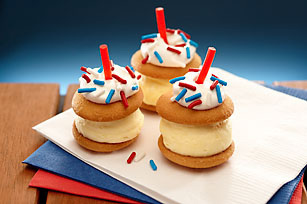 Dip tops of wafer sandwiches in remaining COOL WHIP, then dip in one of the colored coconuts. Insert licorice piece in top of each. If you have any pudding mixture left over or choose to not make all 42 wafer sandwiches, layer remaining pudding mixture in parfait glasses with fresh fruit, such as strawberries and blueberries. Top each parfait with a dollop of the remaining COOL WHIP.